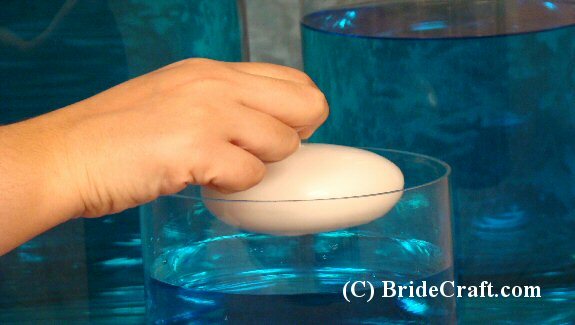 Searching for an easy floating candle centerpiece for your do-it-yourself wedding? Consider this super simple design! Your guests will be pleased with the elegant twist on an old favorite and you’ll be pleased with the price. Below you will find a step-by-step tutorial that will walk you through this quick and easy centerpiece. Pros: Cheap, easy to customize with your colors, supremely simple and elegant. No worrying about any perishable items, and this centerpiece is easy enough to be delegated to any of your helpers on wedding day. Cons: Transporting glass is the trickiest part of this centerpiece. It’s best to transport your glass vases wrapped in paper and packed in boxes to the venue. Be sure to save the paper and boxes for use later transporting them home. 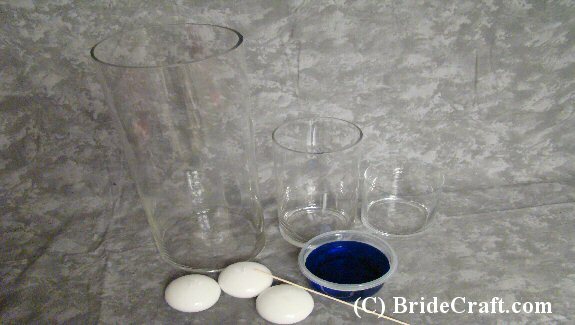 Step 1: You will need three vases of varying heights (we used cylinder vases), three floating candles pucks, food coloring and a stick to stir the water with. 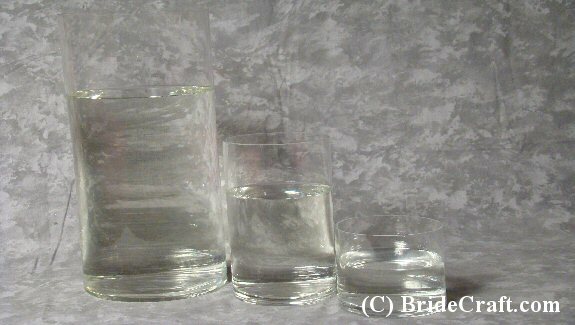 Step 2: Fill your vases to three heights with water. Do not fill too close to the top, as you will want the glass to protect the candle from any type of breeze that might threaten to blow it out. 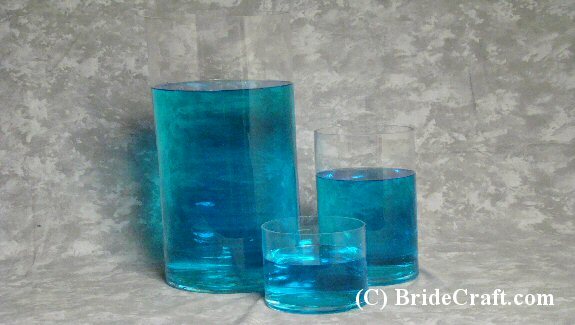 Step 3: Pour a small amount of your food coloring into the vases. 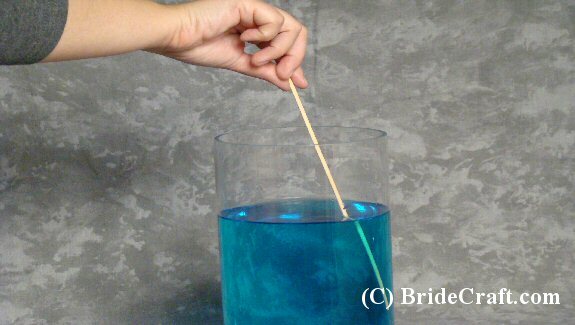 Step 4: Stir the water with your stick until the color is uniform. 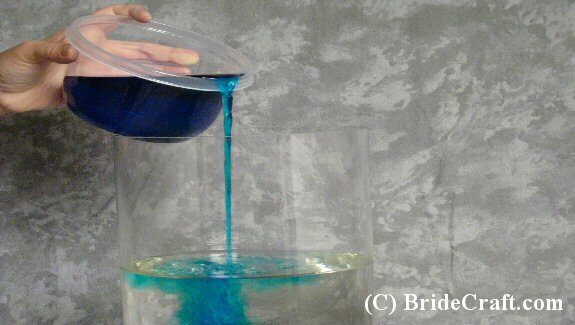 If the desired color is not achieved, continue to add in small portions of the food coloring and stirring until your preferred color is obtained. Step 5: You might have something like this. 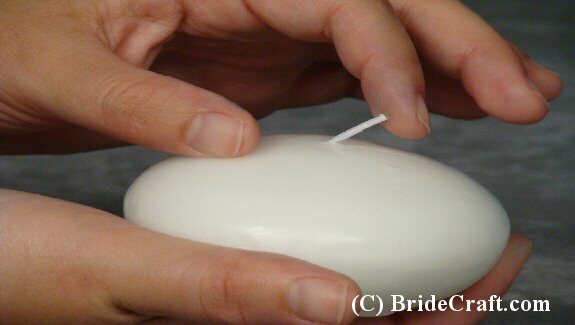 Step 6: Take your floating candles and carefully lift the wick away from the body of the wax. 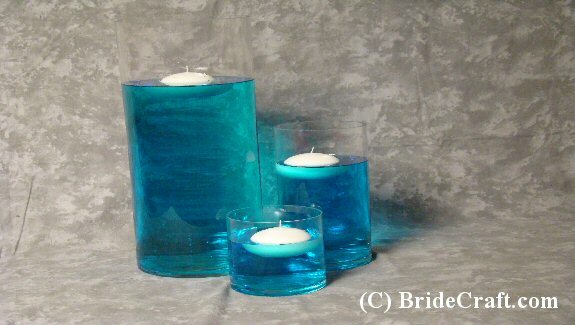 Step 7: Carefully place each candle into a vase, making sure not to get the wick wet. Tip: Remember, a wet wick will not light! Step 8: Keep a long nosed lighter handy for lighting, and you have a an inexpensive yet dramatic floating candle centerpiece for your wedding. Enjoy! 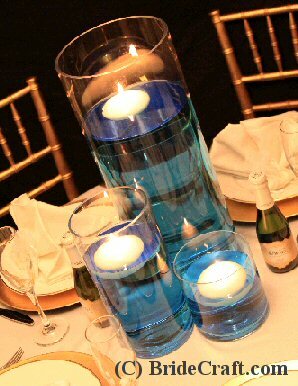 Return Floating Candle Centerpiece to Centerpieces Page.